You are currently browsing the category archive for the ‘weather’ category. When I checked the weather, the data took my breath away. Today was a scheduled bicycle ride day. 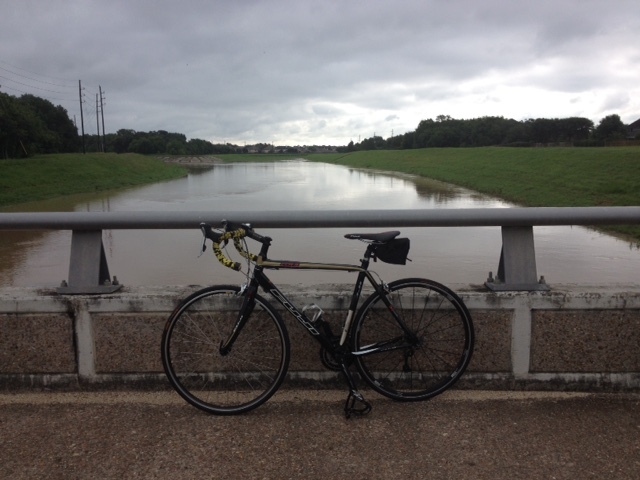 In Houston the weather for bike riding makes year-round peddling a possibility. This news, however, could toss a wrench in my day-off plans. The temperatures were down to 45 degrees. In Houston terms that is very chilly. A 5 mph wind calculates into a wind chill of 42 degrees. On a bicycle with the increased riding speed of 15mph that would feel more like 40 degrees. Brrrr! Now, it was time to think and remember where I stored my cold weather riding clothes. 40 degrees is about my limit for comfort when it comes riding a bicycle outdoors. Anything colder means that I have to carry an ice pick and stainless steel flask filled with hot chocolate. My base layer was set. All of the gaps for exposed skin were closed up. Good socks fit into my riding shoes. My riding jacket was ideal for this kind of weather. Of course my long finger riding gloves were essential. My last item, however, eluded my searching. That is one of those rarely used items that you relished on your last cold weather ride. But, my short term memory was no better than my long term memory on this search mission. I looked in boxes upstairs, downstairs, garage, closets and miscellaneous containers. There sure are a lot of miscellaneous containers around our house. Each one is filled with really useful and valuable stuff. One of these days I am going to sort out and organize all of it. So, I paused to think. Where would I have put that one last cold weather piece of clothing. Ahah! With a quick step into the garage and a look inside my gear for motorcycle riding, I pulled out that special items, Balaclava! No, it is not a Middle Eastern dessert. There are no nuts or honey with this piece. Instead, it is made from bamboo, making it tough. It is light weight and just enough coverage to make it comfortable for my head not to freeze during a cold weather ride. Now, I was ready. I pushed off and settled on to my bicycle seat. Soon I was getting into a rhythm for riding. The exposed parts of my face felt the chilly temperatures bite into my tender skin. But, the specialty clothes that I wore kept me very comfortable. It was a reminder that the world that the Creator gave to us has its down sides. But, with some great choices a careful pattern of dress could easily protect us against the elements. Keep on enjoying His presence and the good feeling of a brisk morning ride. Our realtor was our guide to our newly adopted megacity of Houston, TX. We had no idea where to live or what to look for in local construction. A vague budget was in our minds. She showed us a house with all of the basic room necessities and good curb appeal. Some of our wants were also on the list. Most importantly the price was within our target range. Yet, a price range for a couple like us that was devastated in the housing market crash didn’t have much to put down for a new home. I looked at the construction issues with the very used home and figured out that the next decade of our life would be saving up to make major repairs on this fixer-upper. Houston is famous for its heat. Good windows are a must to fight the blistering temperatures in the summer months. Keeping our air conditioning system happy was important. The windows would eventually have to be replaced. We had that in mind when we made on offer for the house. Now, it was time to sign a contract and replace the windows with new ones. Old windows are being torn out. New well-insulated and excellent guaranteed windows are going in. The installers are doing a superb job. Half the windows are now done. I can see clearly now! The old broken seals and fogged up windows are going away. The new glass is clean, clear and firmly mounted with strong heat resistant materials and block out unbearable temperatures. When the fogged up windows of our home make it impossible to enjoy the views it is sad. The whole house feels ugly. Now, the improvement has given us a lift. Looking outside is fun again. Watching clouds float by and the daylight turn into night is enjoyable. When we open the windows to let the cool winter breezes flow inside, the windows slide easily. We don’t have to grunt and tug to get old corroded windows to scrape painfully across worn out tracks. Figure tip control of well-made locks and well-lubricated tracks bring a great enjoyment to our home like few other purchases could. Cost? Yes, it must be one of the most expensive home repair options that an owner must face. We counted the cost, prayed over the options and even took on additional income jobs just for this very reason. Then, God gave us His favor in an unexpected way. He is good, all of the time! Have you visited the mighty Pacific Ocean? It is unforgettable. There is something remarkable about this massive body of water and how it impacts the land that is home for all of us human beings. Countless people flock to the shores of the saltwater expanse. They play on the beaches, marvel at the power of the shifting currents, take advantage of the teaming life below the surface and find an incomparable respite every evening when the sun sets with a unique masterful display of color. There is something else about the ocean that leaves a mark on our human memories. Along the shores, up in the hills are the vestiges of another power common on the ocean. It is the wind. Temperatures shift and start the air moving in powerful layers from one direction to the next. God set this in motion with the creation of the world, currents not just in the waters but also in the air that keep alternating directions. It is the wind. Tall fir trees with trunks gnarled, bent and twisted by the constant blowing of the winds stand in groves along the coast. They give me pause. Each one has stood against the threats to level them. Storms and daily pressure have left their mark but the trees still stand. The scars and wounds add to the beauty of the fauna that decorate the hills along the edge of the Pacific. It is amazing that they have survived. While many gaze at the vast oceanic vistas, I for one turn away and soak in the scenic sculpture created by the winds and the strength of life in the trees. This forest of trees almost appears as an army of sentinels slowly making its way to the sea. The onslaught of the sea winds have taken their toll on the tree features and come to a truce. Each force standing at the edge of the battle lines respecting the right of the other to be present. The ocean coughs up its winds and the trees bend their boughs. Yet, the roots grip tightly to the soil and will not release further ground. It is a scene of power and persistence. God created this dynamic picture of life. Nothing is static when it is truly living. There is always growth, always movement and always change. Keep on living and keep on with growing. Change as necessary. But, hold on to what is important. The air in Houston is just plain HOT in the summer. Temperatures soar into the high 90’s and stay there. By the middle of the morning the nasty partner of Southern heat joins in the unpleasantries. High humidity. From practical terms we refer to such days as two shirt days. I carry an extra shirt in my truck or make sure that one is handy in my office, neatly hanging behind the door. On especially sweaty days I will head to the club, swim a half of mile and then take a long cool shower. Time and appointments are not always friendly to a human seeking relief from the relentless heat. There are moments when the air conditioning of my office, my truck or my home is like a refuge where island hopping is the standard fare for the day. The temptation to complain is high but never recommended. Instead, we Texans learn to put on a happy face and say something good. “The humidity is good for your skin,” we laugh. No one really believes this words but it certainly brings about a moment of laughter that brings just a moment, ever so brief from the brutal weather outside. Duty called. I needed to get to other side of our building. If I had wanted to I could have keyed the entrance passed through several doors on my way to the other end of our campus. Instead, I braved the idea of walking through our outside atrium. It meant stepping into the outdoor weather, albeit briefly. Steeling my soul, I opened the door and walked briskly through the garden. Surprisingly, the temperature and humidity did not grip my breath away. In fact the weather, while warm, was quite pleasant. My steps slowed to a casual stroll. Why wasn’t the torturous Houston summer weather strangling me? I stopped and looked up. I am going to like it here in our new campus. This unexpected feature was value-added to our bustling campus of students digging into their graduate studies. Stumbling into and onto this refreshing discovery made for a memorable day. Do you have a place of relief from the summer heat? 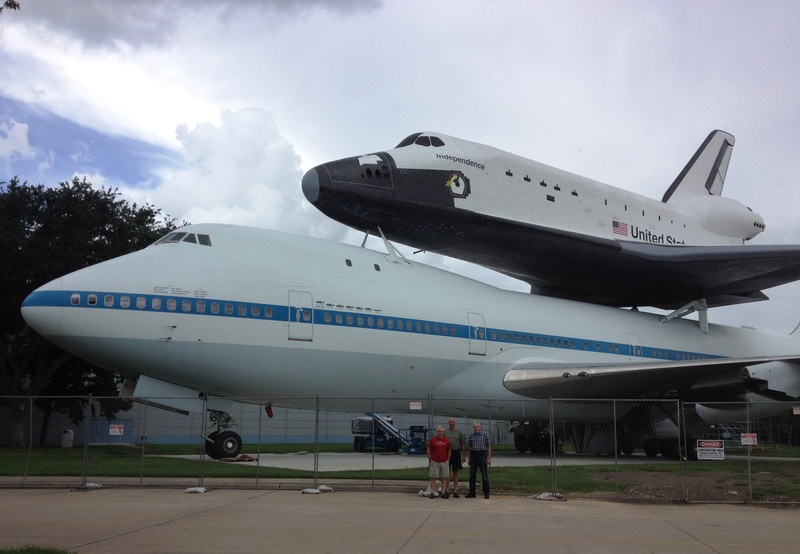 There is an amazing engineering feature in Houston. It is called the Buffalo Bijou. This is a creek for most of its existence, meandering from downtown Houston due West and into the region of Katy. Katy is my home town and the Buffalo Bijou is familiar to me and my fellow residents. We appreciate this cavernous grassy canyon snaking through our community because it is a constant reminder that it is ready to take away the deluge of water that visits our part of Texas several times a year. When there is no rain and the weather has no prediction of precipitation, I along with my fellow Texans overlook this massive amount of real estate. Green grass lines the banks of this very large creek and overpasses allow traffic to flow unimpeded. But, it is always ready. Most of the year a small creek travels through this piece of land. The slow-moving waters do not cut much of a trail through the dirt. Most adults could easily leap over the creek without much effort. I bicycle along this body of water and marvel at its great expanse. For miles my bicycle wheels roll along the cement trail that lines one of its banks. Several times I cross a bridge to keep my journey going. But, then there are those storms, those Texas-sized storms that drench our home with lots of water. Drains, and canals flow into the Buffalo Bijou. 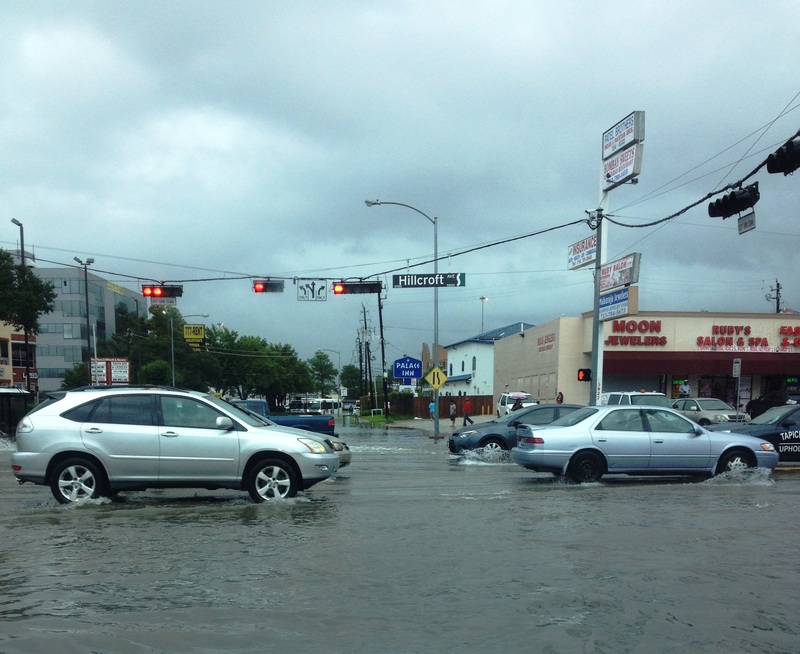 It comes quickly and flash flood warnings dominate the airwaves to keep people away from flooded areas. Torrents of water turn a normally calm creek bed into a raging river. In a short period of time a calm quiet creek fills up that entire flood plain and muddy waters threaten to lap against the massive concrete bridges that gives people safe passage over the rising waters. I paused for a picture and to marvel at what makes people feel so small and helpless. When God turns on the spillway of the heavens and stalls the weather front to hold a pattern over Houston, we hunker down and hope for the best. Neighbor encourages neighbor. It is the way of the image of God seeping through the desperation of men who find themselves in need of a helping hand. Good engineers designed a lot of Houston to weather such moments. I am grateful to those very good planners who looked beyond the pleasant sunny days. Their planning for these occasional horribly rainy days has given me peace. I thank God for them! Getting up and getting going to depart for our workday commute takes a lot of gumption. There is the inevitable magnetism of a comfortable bed that is tough to escape. The ease of staying put all curled up and tucked in is very inviting. Nevertheless, will power and responsibility win the day and soon we are washed up, fed and loaded up for our 24 mile commute. Rolling into traffic reminds us that we are glad that we did not procrastinate. Already, traffic beginning to build up. The vast majority of Texas drivers are polite and safe. Usually, there are a few who got up late and are in a big hurry. They take advantage of everyone else as they zip in and out lanes. So, the rest of the courteous drivers, shrug their shoulders and drive on to their destination. Maybe that is why the Lord blessed so many of us with a sensational sunrise. It began slowly but steadily. In the East there was a glow on the horizon. Someone could have mistakenly thought that a massive fire was lighting up the sky. In some ways the sun is a fire-ball but off of our planet and orbiting in space far away to keep us from burning but close enough to provide light and warmth. The Creator was amazing in the proportions of distance and angles to best show earth how His design was stunning. With more and more miles falling behind us, the glow ahead grew and splashed against the dark sky of the receding night. Like the dismissal of an undisputed champion, the night is not even missed. Instead, the crowds of commuting humans have to smile at the free light show that is capturing the skies. Bright yellows lick away the night. Then, glowing oranges take the broad brushstrokes of the low hanging clouds. Reds trim the front assault of the orange strokes. There is nothing human about this display. Everything about it is heavenly. Both in expanse as well as in dynamic shifts the hand of God shows off His creative display. For all that we commuters tolerate for the sake of life and duty, we do get this occasional treat. 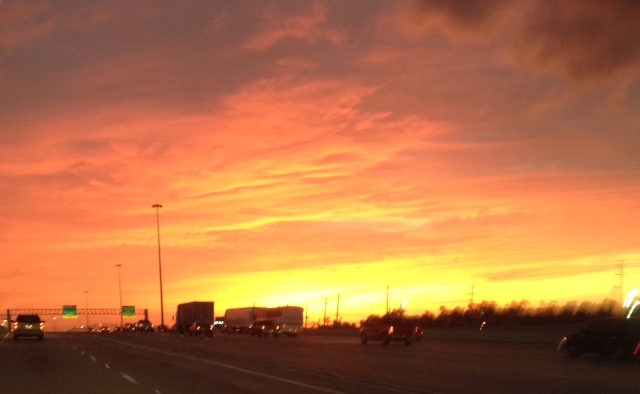 The Texas skies seem to be prepared canvas for the intricate creative strokes of the Almighty. It both takes your breath away and gives you a reason to keep on breathing at the same time. 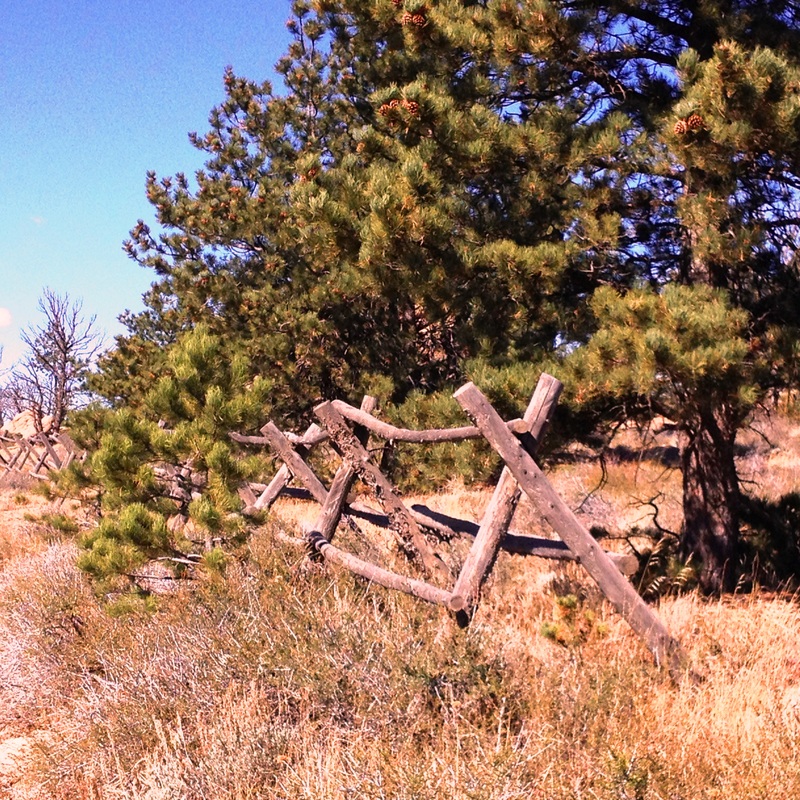 Along the unimproved roads of the Vedauwoo National Forest are long stretches of boundary fences. They are hewn from the local trees by skillful lumberjacks. These boundaries are not elaborate but instead they are simple in design yet sturdy and durability. 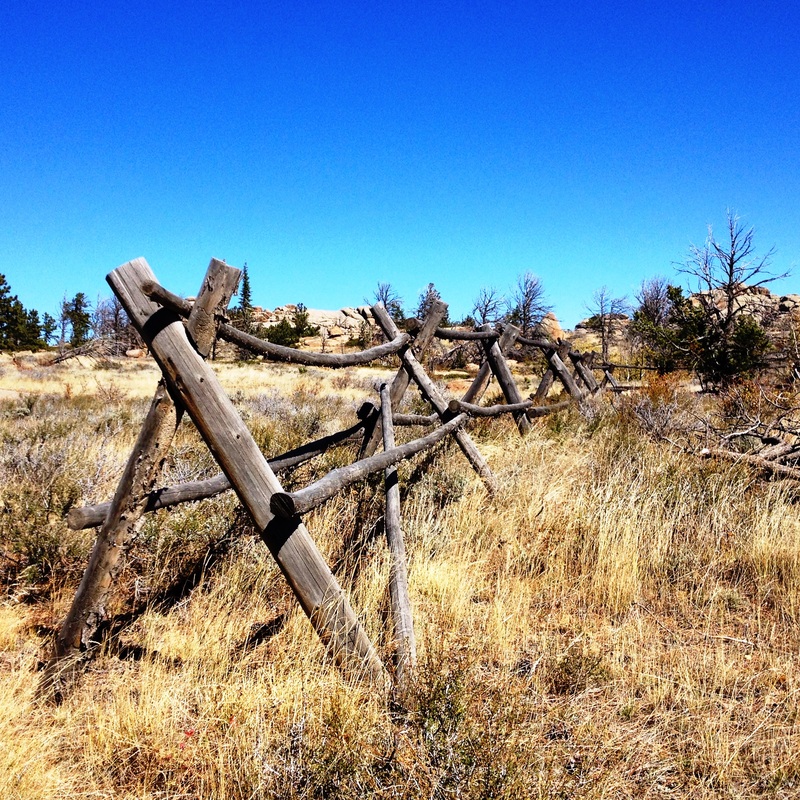 Over the years they withstand the brutal weather of the Wyoming wilderness. These territory markers captivate the eye. I am drawn to follow their endless lengths that disappear into the woods. The forest swallows them up. Tall grasses lick the lower rails. Foliage from bushes, trees and weeds crowd the guardians of property lines. Yet, with little maintenance these consistent fences just keep on existing, marking off territories and keeping mostly humans from trespassing. There is a test from the wilds of the backwoods. Can these man-made structures hinder the wildlife and make the existence of the wilderness fauna feel unwanted stress? Will human intrusion strain the wanderings of the beasts of the field? 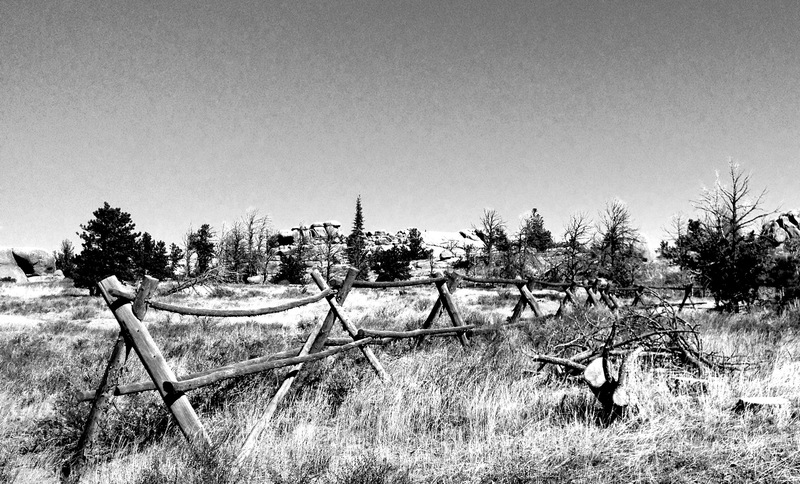 The prairie goat, Pronghorn Antelope, saunter up to these fences. A herd of these goats then slip underneath them without hesitation. They seem to big to manage this maneuver but having witnessed it many times I am a believer. Deer hardly blink at these obstacles of split timbers. They can leap over them from a standing position. When God made these graceful creatures, He knew that a jumping ability as well as eyesight, olfactory sensory perception and speed were great assets to them. Elk for massive and powerful creatures. A fence like these can be jumped over or smashed. They are creatures of determination and know where the bypass areas are. Small animals like rabbits, badgers, squirrels or chipmunks use the fences as a hiding place or freeway or shady refuge. None of these little creatures whine about any intrusion but instead accept them as part of the terrain. Humans, who are created in the image of God, should be so flexible. Time marches on and the weather beats against the wooden fences with every passing season. Instead of wearing out the fences change color and sport a weathered look. They actually look better and more fitting with the environment over time. Man’s intrusion into the wilderness is not always bad. They have been ordered by the Creator to exercise dominion over creation. It is good and right when man enters the world of the woods and leaves a good trail of his visiting the wilderness. 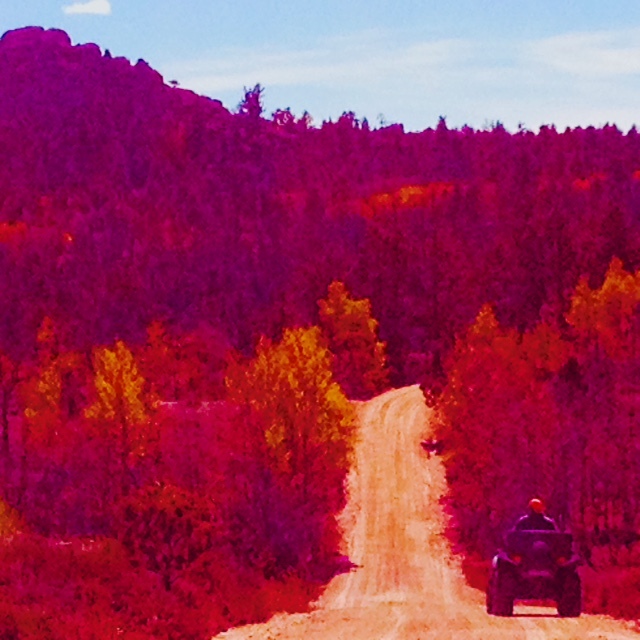 Andy asked if I wanted to join him on an ATV ride through Vedauwoo National Forest. “Sure!” was my initial and only response. It was October and the promise of a sensational vision for a Houstonian was all of the motivation that I needed. God created our world with an annual weather warning. Before the harsh winds of winter, the brutal blizzards of the mountains and the frigid temperatures of the stormy season He gave us the Autumn. This is the time of the year to count our blessings of the past Spring and the enjoyable invigorating days of the Summer. The deciduous trees can feel the cold coming long before any mammals can detect anything. Slowly but steadily they turn-off the sap that feeds the life from roots to leaves. The chlorophyll disappears. Green leaves now turn red, orange or yellow. The forest is rich with the bright colors that entertain but also signal the coming of winter. It is time to hibernate, hunker down by a warm wood fire for the next handful of months. A cold snap had already visited this 7,000 foot elevation several times. The trees do not fight it. They submit to forces greater than themselves so that in the Spring they can revive and awaken to a new year. Andy was leading the way. I stopped. He kept riding. That is when I gratefully snapped a picture of his entering into the wonder of Autumn. There were no freeways filled with vehicles or throngs of crowds rushing to work or air controllers trying to schedule massive airliners on to a crowded runway. Instead, the sound of a smoothly running ATV carrying a good friend through the spectacular woods was a vision exclusively laid out for my eyes. The Creator was displaying His masterpiece in motion. Add texture and depth to this rainbow of colors and I could feel my soul breathing in deeply the refreshment of life. Every human being should be so blessed. When I reached for the key to start my ATV, I found myself smiling. Life is busy. It is full of heavy responsibility. Decisions of major proportions no doubt were piling up on my desk back at the office. People were wondering when they could discuss the next major issue that they were wanting some direction before they pulled the trigger and committed resources. For now they had to wait while I recharged my batteries with the One who called me into His service. Thanks for the invitation, Andy. It was a fabulous ride. Thursday was not unusual for Houston, weather wise. The clouds overhead were dark and overly pregnant with moisture. 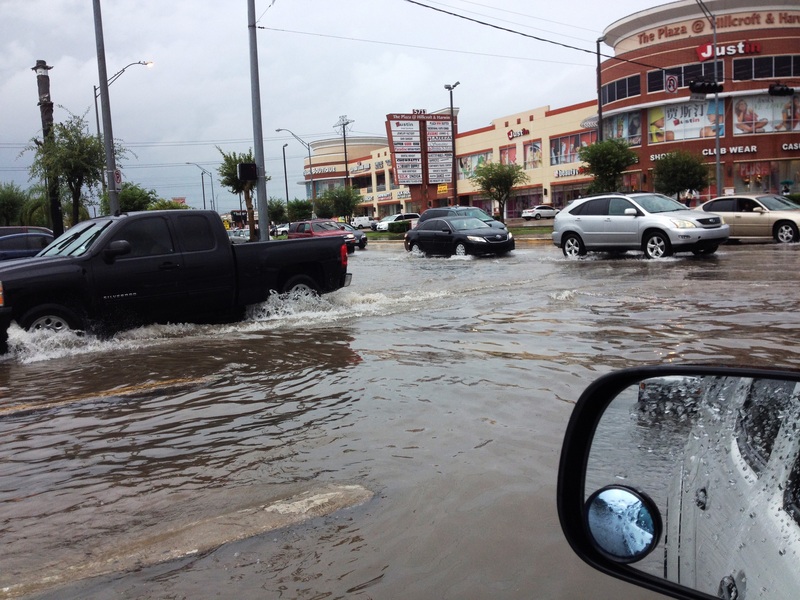 Meteorologists had forecast heavy rains and sent out flash flood warnings. I listened but did not hear. I was shocked when I entered my usual surface street route to my office. It was flooded. Water covered the road from the side ditches all of the way over the center line. Ahead of me several cars were driving slowly through water. Each vehicle left a wake behind it. I had never seen such high waters in my three years of Texas driving. At the end of the road was a mandatory right turn. Normally, it is a round intersection with plenty of turning space for 18 wheeled rigs. Now, it was a lake with no name. One car made the mistake of driving the perimeter of the waters. It was so deep on the edges that the little car stalled as water crept up the side of the car and was surely seeping into the car cabin. My pickup truck was blessing me with high ground clearance. Nevertheless, I felt incredibly vulnerable. There was no relief in sight. As far as I could see the road ahead of me was a muddy river. People had pulled off the roads and parked in strip mall lots. They stood under umbrellas and watched us ford our way through the waters hoping to find higher ground. An emergency vehicle was with them standing by to lend a hand. They were not looking at me. A small subcompact car was stranded. The driver had tried to make it into the strip mall lot but the water depth on the sides of the road are especially deep. The driver had his emergency flashers on. His car was flooded. It was a sad sight. I rounded the last turn to my office. After several attempts I drove into our lot from the back. 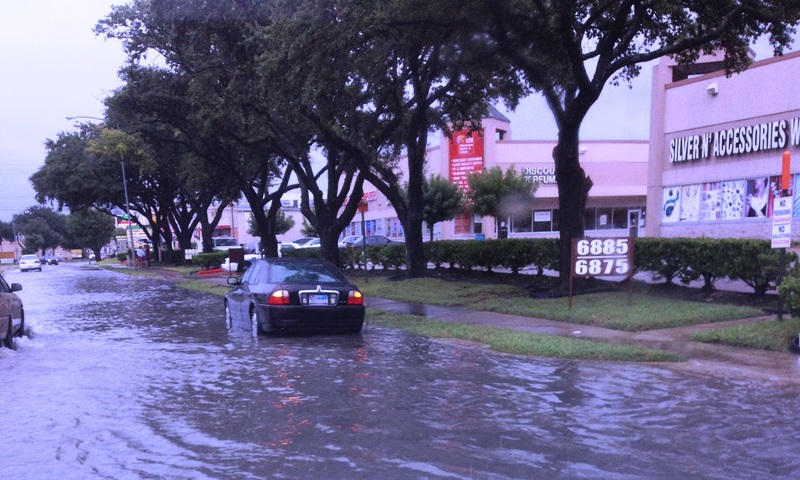 That’s when a driver and a Good Samaritan were pushing his stalled car through the deep water and up into a parking lot to assess the damage. Floods make little humans feel very small. Our expensive vehicles are easily made vulnerable when the waters rise over 12 inches on our roads. I made it safely and breathed a sigh of relief and thanked God for the high ground clearance that He made possible for me to purchase three years ago. Tuesday night there was more than thunder rumbling through my adopted city of Houston, Texas. Michigan buddies rode their motorcycles into town for a visit. That is over 1,000 miles of road warrior travel just for the sake of the ride and good memories. These residents of the Motor City were introduced to a metroplex with a penchant for individual vehicle transportation. Everyone drives in Houston. You cannot live here very easily without a vehicle, preferably a pickup truck. Some have even assessed our city culture and suggest that a vehicle equals or in many cases surpasses the choice of a place to live. Is that extreme? Most of us who live here would at least suggest that there is some merit to that assumption. My motorcycle buddies at least have that thought planted in their minds. They were introduced to Houston traffic after a long day of riding. Add to the stop and go traffic of I-610 a major thunder-storm and it really gets dodgy. Not only was the rush hour traffic horrendous and the thunderstorm unpleasant but construction with narrow lanes and debris added to the tricky negotiations of motorcycle riding. Of course those occasional out-of-state transplants who speed and cut annoy everyone. Too many in traffic jams are on their phones texting and drift over their lane lines and squeeze a motorcyclist. Aside from the hazards of riding our fellowship was amazingly fun! The rain kept pouring down so we parked the bikes under the hotel eave and piled into my pickup truck for a tour of the NASA Johnson Space Center. It was a perfect day to visit. Schools were not bringing in bus loads of children and the tourist season had already ended. Without the crowds we could see everything and did not wait in lines. The displays and historic moments were easy to enjoy and take in for our easy riders. Standing next to the massive 747 and Shuttle we felt our diminutive size but also sensed our enormous pride in what our nation has able to do. Our smart phones have capacities that old computers in the past could not do. Yet, our nation launched men into space, landed them on the moon and brought them safely home. 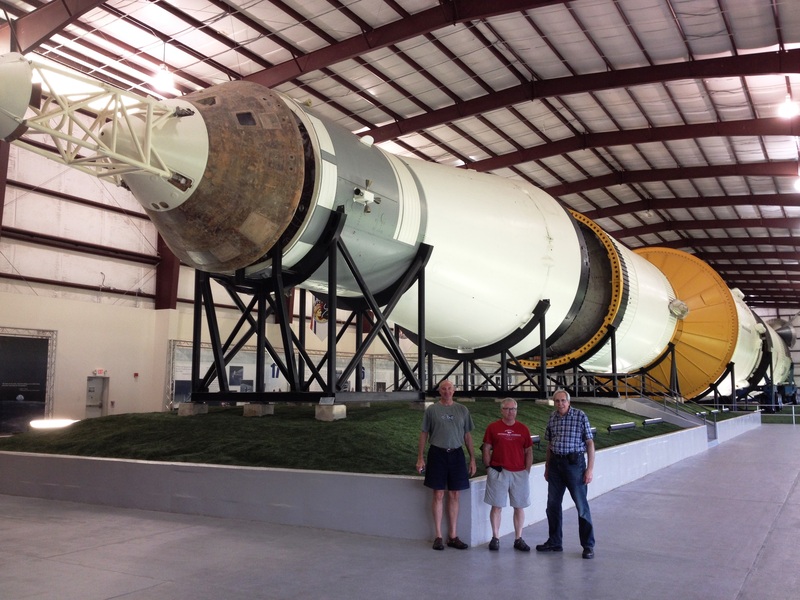 Our little band of bikers took in the size and sights of NASA’s greatest accomplishments. Mostly, our time was about our journey through life, friendship, past rides and fun adventures. 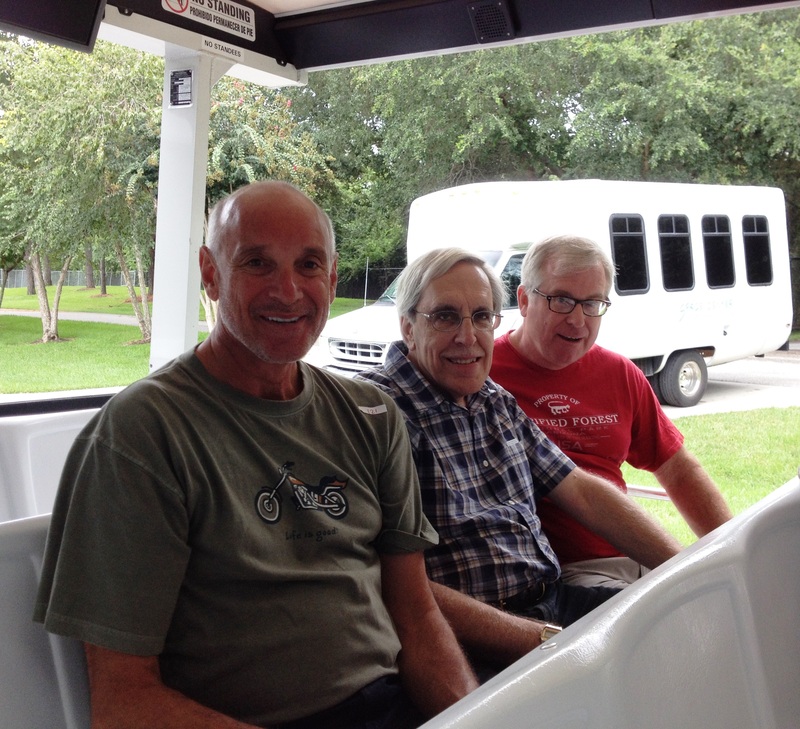 Ron, Richard and Scott are great friends and even greater buddies with shared memories.